The congress venue. The ERPW 2019 will be organised on the premises of the Stockholm University. All scientific events, including the opening and closing ceremonies, the lectures, the poster sessions and company exhibitions will take place in the buildings of the Aula Magna and Juridicum. Click here for a plan. The University is located in Frescati, which is a green peninsula and the former royal hunting area in Stockholm. The address is Frescativägen 6, 114 18 Stockholm. 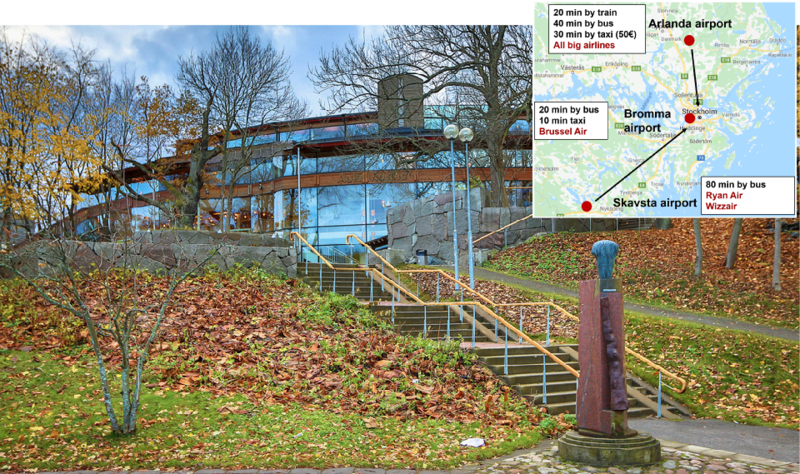 The Stockholm University can be best reached by the subway (Tunnelbana). Take the red line towards Mörby Centrum and get off at the station Universitetet. Conference office. The conference office will be run by the Congress Service of the Stockholm University. The e-mail address of the conference office is: erpwreg2019@su.se. The Swedish Currency. Please remember that Sweden has not entered the European Monetary Union and retains its own currency - the Swedish Crown (SEK). Stockholm can be reached by air via 3 airports: Arlanda (the biggest international airport), Bromma (the city airport accessed by Brussel Air) and Skavsta (for low budget airlines). All airports are connected with the city by the Flygbussarna bus line.